Call me an incurable romantic if you must but I find it hard to accept that words of my childhood, and indeed my children’s childhood, words like conker, dandelion and bramble, are now used so infrequently they have been excised from the Oxford Children’s Dictionary to make way for new works like hashtag. It may be true that children today rarely play conkers (too dangerous we are told), stain their bare knees yellow with dandelion flowers or gather brambles in late summer. Yet surely they need this vocabulary to understand and enjoy our heritage of poetry, stories and songs, stretching back through the generations? The Lost Words project is the antidote to the deep feeling of loss we experience on learning how these names have slipped out of common usage. The author Robert MacFarlane and author and illustrator Jackie Morris have produced a set of illustrated, spells celebrating 24 common plants and animals that have been dropped from the Dictionary. In addition to the above, the list of Lost Words includes kingfisher, willow, wren, ivy, acorn, heron and fern – in fact 21 of the 24 species have been seen in the RBGE during the regular wildlife walks conducted by Robert Mill and his team of nature spotters. 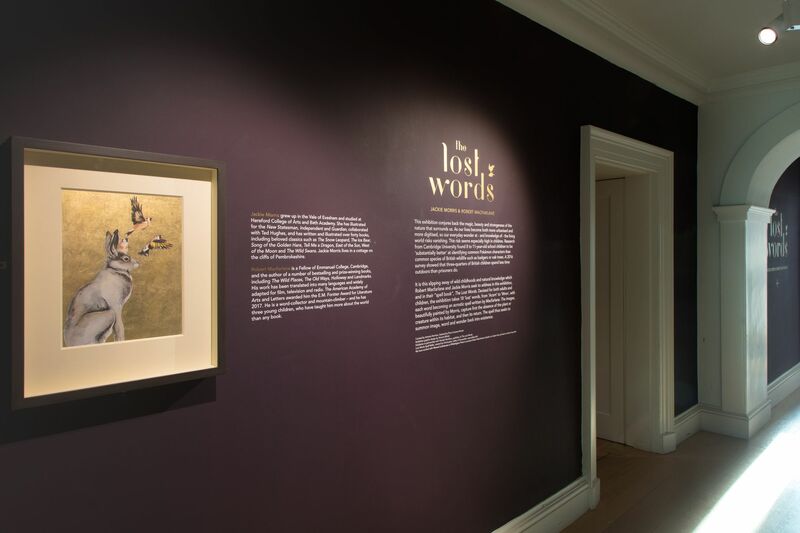 The Lost words is an illustrated book, currently topping the Sunday Times Children’s book list and also an exhibition of the original water colour painting and hand-printed spells, which is opening in Inverleith House in May. The Lost Words book and exhibition are also a great inspiration and resource for parents and teachers. To help get the maximum value from them the John Muir Trusts has developed an on-line Explorers Guide which provides ideas for activities as well as starting points for discussions https://www.johnmuirtrust.org/latest/news/1350-new-explorers-guide-to-the-lost-words-now-available . Every school has a Children’s Dictionary and a group of enthusiastic parents and teachers have begun a campaign to also get a copy of the Lost Words into every primary and secondary school in Scotland. If you would like to know how to support them in their aim please follow this link to their crowdsourcing page http://www.crowdfunder.co.uk/thelostwords. The Lost Words exhibition begins in Inverleith House on 10 May. There will also be a trail around the Garden for schools and families over the summer. Great news, Ian; looking forward to the exhibition. Hopefully, the word “conker” will never be forgotten.